FiiO always amazed with their products and the quality they were capable of in their price range, so I was very anxious to hear their new flagship since the day I’ve first heard of it, almost two years ago. FiiO X7 impressed me even with its looks and feel from the first moment, presenting a very appealing design and good / sturdy build quality. The unit runs on a Android 4.4 platform on a hardware platform that contains a quad-core Cortex A9 (RK3188 SoC) CPU running at 1.4 GHz, 1 Gb of RAM and 32GB ROM(27 available for the user). I am really happy that X7 has a touch screen and FiiO got rid of the scroll unit. You can start X7 in Pure Music mode that discards the Android interface and only keeps the FiiO player. From my tests, Pure Music mode sounded a little better than playing in Android mode which is the second option you can start FiiO in, but the differences were not that obvious. Android mode is as you would expect a basic Android experience, which gives you access to the playstore and fiio market. I installed Tidal and listened to my music from X7 and I just loved the sound performance I got with this DAP. You can read more info about the features and specs right here. The tests were performed with FiiO X5, FiiO E12A, Ultimate Sound US3D Ciems, Meze 99 Classics, FiiO EX1 iems, Sennheiser HD800, Audio Gd Master 9, Focal Electra 1028BE, Audio GD Master 10. I have tested the unit as a whole but also as a dedicated DAC in my speaker and headphone systems and X7 performed quite decent as a standalone DAC, however it seemed to have less power (1.4V) than X5 (1.53V) on the lineout output, so I needed more amplification afterwards. The 0.13V difference between X5 and X7 is quite obvious. Personally, I think that the line out needs more power if FiiO wants X7 to be used as a dedicated DAC in a speaker/full sized headphone system. X7 has a modular design, so the amplifier that comes with it is detachable, but this is the default one that comes with the unit. FiiO released the specs publicly so anyone could make their own amplification unit. Testing it with my beloved US3D ciems, I have noticed that the default amplification module is good, but not as clean, detailed and snappy as my external FiiO E12A which brought a very noticeable improvement to the listening experience and let the wonderful DAC of X7 sing closer to its potential. The standard amplification module is good, but kind of mediocre overall, and doesn’t quite does justice to the full potential this DAP is capable of. However, I was very pleased to know that FiiO will soon release a new amplification module that is has a very similar design and specs to E12A. High power module: Use of the LM49600 op-amp planned for power amplification of full size headphones. While I’ve tested X7 with the Standard module, I’ve chosen to listen to it and test it with E12A as it lets the unit shine more than the standard amplification. The major tests were done with X7 + E12A. The first thing that struck me was the air of the scene. Every instrument was breathing with ease in a very opened soundstage. This might be the biggest stage I’ve heard on a DAP until now. One other thing that is very apparent especially when you compare it to x5 is the bigger amount of details it is capable of. Every instrument is vibrant, detailed and extended in a natural and textured way. Another very pleasant quality X7 has is the natural tonality it gives to the music. The sound flows with natural timbre and musicality. The voice is so so well textured and present that it creates a more intimate atmosphere between you and the singer. The stage is again very spacious, natural and holographic. There is a piano in the back that has incredible sparkle on the higher notes and weight on the lower ones. This flute and song is just magical on the good audio gear and X7 offered a mesmerizing experience. I loved the texture of the flute and the way you can almost feel the flow of the air, hear the breaths James Galway and the touch of the lips. This song was a totally different experience compared to X5. The guitars from the beginning have excellent detail and extension. They just became alive along with the choir / voices that came after them, which were multi layered present and created an increasingly energetic experience that got me into rock and headbanging mode. The drums were excellently punchy and extended and I’ve heard something I never noticed on X5. I am referring to the reverberation after effect of the drum’s membrane after the hit. I could almost see the drummer rocking on this song. The unique rock voice of the singer was very well presented by X7 as well and created an even more energetic and rocking experience. Rock on! The soundstage is very impressive on this song as well. You can hear reverberation of the chords bouncing in a large space. The guitars are mesmerizing, an audiophile delight. Each pluck is energetic and vibrant, followed by a very detailed and textured extension. While the transients are fast and impactful, they are still musical and the passages from one note to another is done in a flowing and musical way. I must say that I fell in love. Damn it…I want the X7…badly! I know, same artist, but I just couldn’t restrain myself from writing about this song as well. I just fell in love with these guitars on X7. They are incredibly vibrant, full of life, detailed and extended. Another thing I have to point out is that the lower extension of the chords is very natural and detailed. The tactility and details on x7 is top notch. You can hear every finger touching the chords, the palm hitting the guitar in such a natural manner that it’s like seeing the artists in front of you. When the electric guitar came in the song I just lost myself in its extension and the song. I just closed my eyes and listened. It completely hypnotized me. The bass hits hard and goes low. While I’ve heard faster bass responses, X7 is good in this category as well. The song was energetic, impactful and as usual with good gear, presenting similar effects with a strong dark coffee. The bass can be very impressive in most situations. I still remember how the guitar plucks from Rodrigo y Gabriela excellently extended to lower frequencies. It also knows when to punch hard and it does that with good energy. The control of the bass is quite good but I’ve hear faster ones on other units, especially on electronic music like Infected Mushroom Mambacore for example. The midrange is excellent on X7 and if you have some headphones that can shine here, you’ll be in for quite a treat and you’ll be surrounded by details, textures and emotion. The treble is well extended and sparkly when it needs to be. I didn’t find it harsh or bright at all, however if the headphones have a peak in this area, X7 won’t hide it. The voices are a pleasure to listen to as they vibrate with textures and life. This was one of the first things that popped out while listening to FiiO X7 for the first time. I mean, really, this DAP might offer the biggest soundstage I’ve ever heard on a portable device. And no, it’s not artificially expanded. It sounds very natural and holographic. The instruments and voices have lots of space to breath in, but also layers and layers to be spread upon in the scene with very good accuracy. The transients are excellent and very interesting in the same time and they really shine with the E12A external amp unit from FiiO, as the standard module adds some blur on top and smooths the transients response in the process. The attack is quite powerful and followed by a vibrant and very detailed but fast and natural decay. The transition from one note to another is natural and gives the music a smooth but still vibrant and energetic flow. X7 is a neutral DAP overall, even if on the warm side of neutral. Bright headphones will sound bright and warm headphones will sound warm. I also think that it has a very natural tonality. Instruments and voices are very pleasant and life like. This is another area where FiiO X7 impressed me very much. Details sprung from everywhere and integrate you better in the scene. 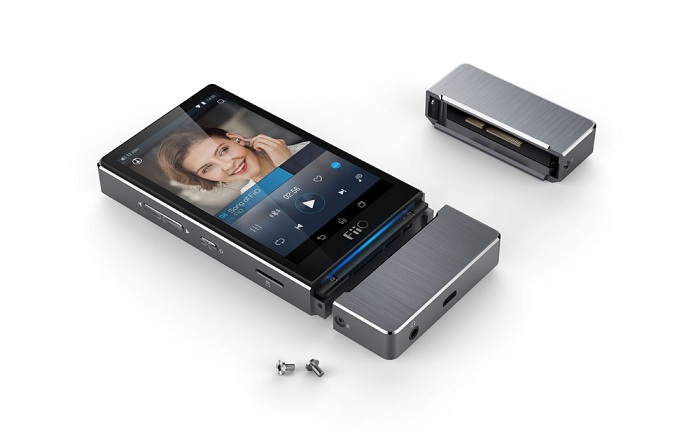 I had no doubt that FiiO will hit the High End DAP market really hard and this is exactly what they did with FiiO X7. I cannot think of another DAP in a similar price range to compete with it. Besides the excellent audio performance, it also has very appealing looks, design and build quality. The modular design is also a great feature as you can get more out of the unit in time. FiiO X7 is a truly high end DAP (especially with better amplification, looking forward to hear the new better amp modules) and it is worthy of your full attention! The standard amplification module is just mid-fi from my perspective. Looking forward to hearing the better ones. Great review Dan! I find with the included amp module, the sound quality is only at a mid-fi level, kind of rough. But when matched with a E12A, it transformed to be top level DAP. Thank you Zeissiez. Indeed, while the standard amp is mediocre, with a better amplification unit, you will get a true high end dap. And btw, thank you for reminding me, I should add this in the review to be more clear. Done! have you heard HM901s ? What would you recommend as an amp to pair with the X7 for sure 846’s? Oppo HA-2 overkill? I think that you can go with E12A or the Aune B1. I prefer Aune B1 overall. Also you can get the upgraded IEM amp module for X7.